Eugène Dubois came into the world at an appropriate time, given the mission he chose in life. He was born in 1858, in between the discovery of the first recognized Neanderthal fossil and Darwin's publication of On the Origin of Species . In medical school, the young Dubois thrilled to a talk by visiting lecturer Ernst Haeckel, inventor of the term "missing link." Dubois vowed to prove Haeckel — and Darwin and Alfred Russel Wallace — right by finding "the missing link" between apes and humans. In the early 1890s, he succeeded, yet the years before and the decades after were anything but easy. Dubois's fascination with fossils started even before medical school. When he was still a boy, evolutionist Karl Vogt gave a lecture at a nearby town, sparking a local controversy. Dubois didn't get to attend the lecture, but he read all he could about the history life, and enrolled at the University of Amsterdam to study medicine. His first paper discussed the structure of the larynx and suggested that the mammalian larynx evolved from gill cartilage of fishes. His advisor, however, surprised him by claiming the idea as his own and expecting an acknowledgment. Dubois agreed, but reluctantly, and bad feelings about academia lingered, despite his speedy rise through university ranks to full professor. Shortly afterwards, Dubois turned his attention away from voice boxes and toward early humans, convinced that fossils would provide the best evidence of evolution. But where to look? Haeckel had suggested Southeast Asia as the birthplace of humans. And Dubois was intrigued by Wallace's description of Sumatra in The Malay Archipelago. Among other exotic features of the landscape, Wallace described abundant caves and, in fact, all human fossils known at the time Dubois pondered his grand project had been found in caves. Beyond the caves of Sumatra, Dubois was drawn by the fact that the Dutch East Indies were under Dutch control. He hunted in vain for private or public funding, but neither was forthcoming. And while he searched for funding, only his naive young wife thought Dubois was onto something. Everyone else thought he was crazy. When he traded his university position for an eight-year commitment as a military doctor in a disease-ridden climate, and dragged his family halfway around the world, he seemed to prove his critics correct. Shortly after arriving in Indonesia, Dubois gave a lecture outlining his plans to find a missing link in human evolution. Based on his lecture, he wrote an article for publication in the Journal of the Natural History of the Netherlands Indies . The article was largely intended to stake his claim the missing-link search. As he had hoped, Dubois's military duties were light, allowing him to focus on fossil hunting. He started fossil hunting in Sumatra, but after two and a half years of disappointing excavations and a bout with malaria, he and his family moved to Java where he had better luck. He found he could start a dig and let others finish it. The local government supplied him with forced laborers to dig for fossils. Natives of the Dutch East Indies had to pay heavy taxes to the Dutch, and they could do that with goods such as tea or coffee, or with labor. Many natives wound up working a month or two every year building houses or tending fields. Or digging fossils for an apparent crazy man. The working relationship was bumpy; the diggers often sold fossils to Chinese merchants who ground up the "dragon bones" and sold them in medicinal mixtures. But the working relationship was also fruitful. Over the years, the diggers working for Dubois found more than 12,000 animal fossils, including pieces of elephants, hyenas and felines. He stored the finds on his veranda, which was seen carpeted in ancient bones. But human fossils were much harder to find. Five years passed before he had evidence he considered sufficient to declare a new species: Pithecanthropus erectus, or Java Man. The evidence consisted of a skullcap, from which he estimated a cranial capacity larger than an ape's but smaller than a human's; a tooth; and the left femur of an erect biped that had sustained, but recovered from, a serious leg injury. Despite the complimentary conscripted fossil diggers, Dubois paid a steep price for his find. He and his wife lost a child to tropical fever, and Dubois himself narrowly escaped death more than once, from malaria, tigers, and collapsing cave walls. Upon returning to Europe, he took an un-prestigious university appointment, and concluded that his greatest achievement would always be finding Java Man. So he was cruelly disappointed when, though some scientists greeted his finds enthusiastically, others dismissed them as ape remains, primitive human remains, or a jumble of fossils from separate individuals. The last claim gained credence decades later when Dubois found an additional left femur in his collections, something he had overlooked. It contradicted his long-held belief that the fossils had certainly come from a single individual. In fact, some paleoanthropologists now suspect that the femur Dubois used to describe Java Man actually belonged to an anatomically modern human. Even the scientists who supported his arguments left him suspicious; the anatomist Gustav Schwalbe used a cast of the skullcap to write an expanded monograph that dwarfed the paper by Dubois. While Dubois languished in obscurity, Schwalbe did a lecture tour on Java Man. Considering the effort he had expended to collect the fossils, Dubois felt, perhaps with justification, that describing them was his exclusive right. Disillusioned, he periodically refused other scientists access to the fossils after Schwalbe's perceived betrayal. A resulting (and inaccurate) rumor claimed Dubois was keeping the fossils hidden under pressure from the Catholic church. His personal life offered him little solace. As a young man, he had been smitten by a very bright young woman, but when he learned she did not return his affections, he married a more vivacious if less clever girl, Anna. Anna took little interest in his work, and he eventually judged her shallow and unworthy. Not that Dubois was an ideal husband. On their return trip from Java to Europe, the ship was caught in such a violent storm that the captain ordered all the passengers into lifeboats. Dubois apparently informed Anna that, should something happen to their lifeboat, she would be responsible for saving their three children; he would be preoccupied with saving the Java Man fossils in the suitcase he'd strapped to his chest. Their marriage didn't end that night, but it did end eventually, with hard feelings on both sides. After his wife's departure, Dubois advertised in the local paper for an attractive, young, live-in housekeeper, and found his ads didn't attract the altogether appropriate kind of help. Despite flashes of productivity, Dubois descended into a bitter malaise in his later years. He rejected the implications of new finds in paleoanthropology (most notably Peking Man, discovered in 1929), and he developed a reputation for using then discarding devoted assistants. Yet even though he was seldom personable, Dubois was brilliant. In addition to identifying Java Man, he deduced a predictable relationship between brain size and body size in different types of animals. This finding enjoyed little attention until decades after his death, becoming the forerunner of new research fields in biology. Dubois's find, Pithecanthropus erectus, was later reclassified as Homo erectus and it is widely understood to be one of the most significant species in human evolution. Whether the femur Dubois brought home from Java was truly from Homo erectus or from a modern human, other Homo erectus fossils have exhibited what his finds did, namely that the lower limbs took on modern human proportions before the head and brain. Homo erectus was probably the first human ancestor to hunt, make fire, make complex tools, and care for the sick. One Homo erectus specimen has been found with no teeth (unable to chew), and another with advanced vitamin A poisoning (unable to move without exquisite pain). Both individuals survived with these conditions for some time — evidence that others of their kind looked after them when they could no longer fend for themselves. Significance of Homo erectus aside, Java Man is probably more appropriately described as an ancient cousin, a branch that moved out of Africa and into Asia before the "successful" migration out of Africa that ultimately led to modern humans. Homo erectus might also have been the first human ancestor — maybe — to make art (depending on how you define art). Dubois's collection contributed to this finding. Among the specimens he collected from Trinil were freshwater mussel shells, interpreted as evidence that hominids feasted on the mussels. These shells wound up at the natural history museum of Leiden. In the early 21st century, scientists reexamined the shells and found that one of them had been worked into an "unambiguous shell tool." Perhaps even more remarkable, another shell had been engraved with a geometric zigzag pattern. The scientists stated that the engraving preceded the shell's weathering and burial, and might have been made with a fresh or fossil shark tooth. Radiometric dating aged the shell at somewhere between 430,000 and 540,000 years old, placing it within the time of Homo erectus. The authors cautiously avoided calling the engraving art, and teasing out the hominid engraver's intentions is awfully speculative. 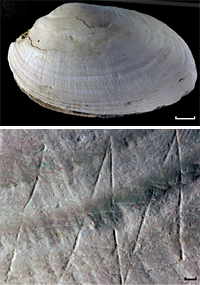 But this predates the next-oldest known geometric human engravings, found in South African caves, by some 300,000 years. Modern scientists point out that Dubois didn't find a missing link between apes and humans, he found an early human.